The lure of stargazing is strong, but the twin hurdles of a relatively high price and a steep learning curve stop many would-be astronomers from investing in their own telescope. It requires understanding the three types of telescopes, stands and mounts as well as lenses/mirrors and eyepieces. Once you have one, you need to know how to operate it, which includes knowing where to point it in the sky (trickier than it sounds). The Celestron Skyprodigy 130 seeks to lower many of these barriers for the entry-level astronomer by providing a high-quality telescope mounted to an automated alignment mechanism that points the telescope for you. What Is The Celestron Skyprodigy 130? The Celestron Skyprodigy 130 is a Newtonian telescope produced by one of the leading U.S. manufacturers of precision optical instruments for consumers. Originally a military electronics supplier, the company’s founder began producing telescopes after he and his son constructed one in 1970. In a Newtonian, one of the three telescope types, the optical tube (the main body of the telescope) has two mirrors that gather and focus the light through the eyepiece. In our comparisons below, three of the four telescope models are Newtonian. The fourth, the Meade StarNavigator NG, is a refractor model. It uses lenses rather than mirrors to gather and focus light. There are advantages and disadvantages to both. The primary difference is that Newtonian telescopes can be made larger with bigger apertures to gather more light without encountering an issue known as chromatic aberration, which distorts image color. Refractor telescopes tend to be better for observing closer objects, such as moon and planets, while Newtonian telescopes are better for more distant and fainter objects, including stars. The Celestron Skyprodigy 130 is named for the 130 millimeter diameter of its “objective” mirror. This is the mirror that gathers and magnifies the light entering the optical tube. This mirror measurement is the telescope’s “aperture." Aperture is the top spec to consider when evaluating a telescope (though not the ONLY thing). A larger aperture produces a sharper, brighter view. The Celestron Skyprodigy 130 has a 650 mm focal length. The focal length is how far light travels from the objective mirror/lens to the point where it's focused. This is the second most important consideration, as it dictates the length of the optical tube, a practical consideration. You will want to move your telescope to different locations, even travel with it occasionally. Big tubes are difficult to lug around. Focal ratio is the focal length divided by the aperture. There is a balance here. A higher focal ratio means more magnification but a much narrower view. A lower one means lower magnification but a much wider view. The Celestron Skyprodigy 130 is designed to see more of the sky at once, which means it will also be easier to aim. This is ideal for a beginner. Eyepieces accomplish the final magnification for your eye. The larger the magnification, the less you can see at once. Thus, you position a telescope first with your finder scope, then fine-tune your aim using a smaller-magnification eyepiece. Finally, you use higher magnification to observe what you pointed at. The Celestron Skyprodigy 130 comes with two eyepieces, and you can buy additional eyepieces as your advance your knowledge, including eyepieces designed for mounting a camera on the telescope. Magnification is often oversold as the most important spec as it sounds “powerful.” Considering the two other important specs (aperture and focal length) and the fact that you can change magnification with additional eyepieces, the Celestron Skyprodigy 130 will make any beginner, most intermediate, and maybe even a few advanced astronomers happy. The mount is computerized and motorized with SkySense, Celestron’s proprietary completely automatic alignment system, which automatically locates 4,000+ sky objects. The user enters what they are looking for on the telescope’s keypad and the telescope aims itself. This is called “go-to” automation. At around $600, the Celestron Skyprodigy 130 carries the second-highest price on our list. However, the quality of the telescope itself, coupled with the advanced SkySense mount, justify this price. Users report the system is easy to use to the point of “magical.” More experienced astronomers complain that things weren’t this easy in their day, so they had to actually learn how to locate a celestial object by hand. An excellent balance that will please beginners and intermediates because the wider field of view allows them to learn the sky rather than being frustrated over the narrow view from higher magnification. Additionally, you can always purchase higher-magnification eyepieces. Celestron-level build quality rarely disappoints. Two year manufacturer’s warranty for materials and workmanship. Available on Amazon for about $$. This is another Newtonian telescope, but it's mounted to a Dobsinian base rather than a tripod stand. Think of a Dobsinian base as a “Lazy Susan” for your telescope. It sits on a flat surface like a table and can swivel left-right, while the telescope pivots up and down. The Orion has 203mm aperture and 1200mm focal length, resulting in a f5.9 focal ratio, similar to the Celestron Skyprodigy 130. However, the Orion’s higher magnification means it looks at a much narrower section of the night sky. For this reason, this telescope is more oriented toward the intermediate to advanced astronomer. The IntelliScope Computerized Object Locator helps you find celestial objects but is not a go-to automation system. It guides you, but you are the telescope’s motor and must do the actual pointing. Stand/Mount – Dobson-style, which sits nicely on table or other flat, solid surface; also great for displaying in your home or office. Uses Orion’s IntelliScope Computerized Object Locator, which has 14,000 objects in its database, but is not automated. It points you to the object, but you have to use the keypad keys to move the telescope following arrows that appear on screen. These eyepieces are included: 48x and 128x. Note that higher magnification may not please many beginners as it means you see less of the sky and it becomes more difficult to locate specific objects. Much as Celestron, Orion is a leader in quality workmanship and materials. One year manufacturer’s materials and workmanship. 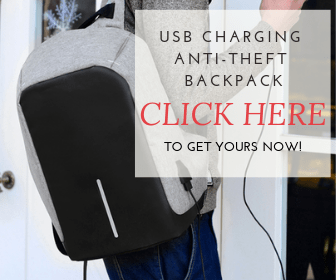 Can be found on Amazon for about $$. Intended as a high-quality entry point for the astronomy beginner, this Polaris has the same aperture/focal length specs as the Celestron Skyprodigy 130, but without the go-to object-locating automation. What it has is an equatorial mount ideal for tracking objects toward Polaris, the North Star. Due to Earth’s rotation, those objects move in circular fashion and the equatorial mount was invented to make it easy to follow them with a telescope. No automation; you point this telescope by hand. Equatorial mount requires practice to use, but ideal once you learn how to. Setup is aided by the lightweight (but by no means less sturdy) stand a mount. These eyepieces are included: 25x, 72x, and 94x. 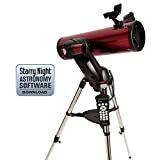 Ideal for a beginner/intermediate astronomer and same specs as the Celestron Skyprodigy 130, but with three different eye pieces and an eyepiece magnifying doubler (known as a barlow lens) for easy locating of celestial objects, then rapidly increasing the magnification to see closer. Users note the sturdy stand/mount as evidence of this telescope’s build quality. One year manufacturer’s on materials and workmanship. 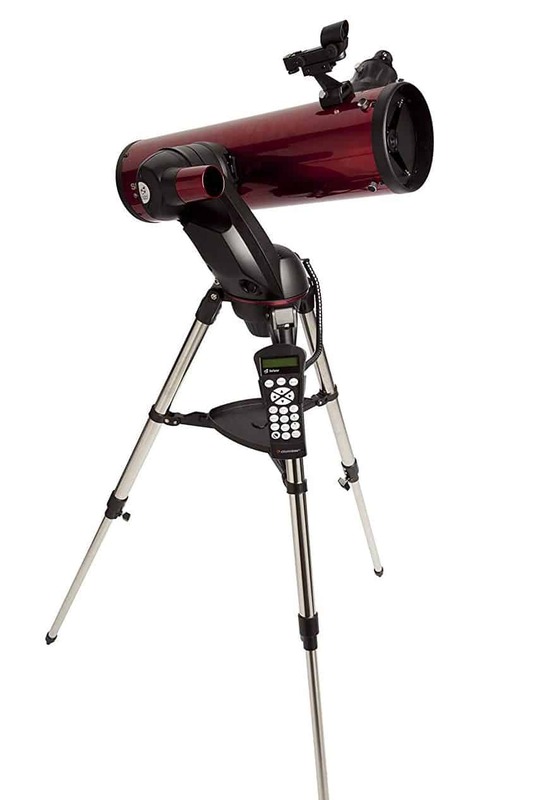 This telescope is available on Amazon for about $455. This is a refractor telescope, the only non-Newtonian on our list. It should not be here except that it meets our other specs, including that it is intended for the entry-level astronomer, has a comparable aperture with the others and a highly-rated go-to object locating system. Meade’s StarNavigator system is excellent and will point you to more than 30,000 celestial objects. However, it requires that you enter initial location coordinates so that it knows where it is each time you use it. These eyepieces are included: 25, 73x. Meade is well regarded for their quality, particularly in the optics. Users call this telescope “sturdy”. One year manufacturer’s warranty for materials and workmanship. Considering our bias toward beginners, two of the telescopes we reviewed here are close competitors with clear differences: the Celestron Skyprodigy 130 and the Meade Instruments 216006 Polaris 130. Interestingly, they are both Newtonian telescopes with the same aperture and focal length. The real differences come in the price, mounting system, and the approach to aligning the telescope with the area of the sky you want to see. The Celestron Skyprodigy 130 nudges out the Meade for its all-in approach. Not only is it an excellent beginner’s telescope on its own, the SkySense go-to automation is almost like having an amateur astronomy club there mentoring you as you use it. The Meade Instruments 216006 Polaris 130 holds its own, though. Think of it as training for a serious astronomy athlete who wears a weight belt to make that training harder so that he grows stronger. Both options are great. Choose the one that best suits you.